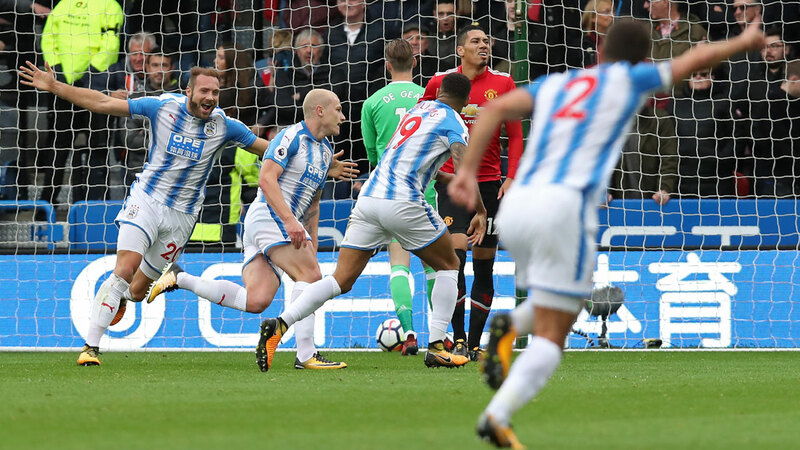 Aaron Mooy and Laurent Depoitre struck as Huddersfield Town stunned Manchester United 2-1 on Saturday to claim a first win over the Premier League giants since March 1952. The pair scored in the first half at the John Smith’s Stadium to end United’s unbeaten start to the season and leave Jose Mourinho’s men five points behind leaders Manchester City in second place. Having protected their goal for 414 minutes of league action, United were rocked by conceding twice within five minutes around the half-hour mark. To make matters worse for Mourinho, both Huddersfield goals were the result of direct and disastrous defensive mistakes from his players. After 28 minutes, Juan Mata lost the ball on the halfway line to Mooy, the Australian signed from Manchester City, who sprinted into the area and slipped the ball to Tom Ince. The winger beat United substitute Victor Lindelof with a skilful touch and forced David de Gea into a fantastic save, with Mooy converting the rebound calmly from a dozen yards. Lindelof, a £31 million ($40.9 million, 34.7 million euros) signing from Benfica, had been brought on as a 23rd-minute substitute for the injured Phil Jones and worse was to follow for the Swedish centre-back. Goalkeeper Jonas Lossl punted the ball the length of the field and Lindelof should have dealt with it in routine fashion. But he completely misjudged his clearance, missing the ball and allowing it to run to Depoitre, who took one touch to ease past De Gea and a second to place it in the back of the visitors’ net. A much-improved second half from Mourinho’s side finally saw them put Huddersfield under pressure. Substitute Marcus Rashford headed in from six yards following brilliant hold-up play and a cross from Romelu Lukaku on 78 minutes. 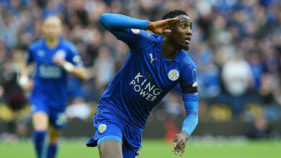 But the game marked a stunning departure, given how solidly United’s defence has played so far this season, although it was no more than David Wagner’s promoted team deserved. The last time United had played at Huddersfield, in October 1971, they had won 3-0 in a game memorable for the fact Bobby Charlton, George Best and Denis Law appeared on the scoresheet together for the last time. But that kind of inspiration was sadly lacking in their play 46 years later, even with Charlton and Law sitting in the stands. 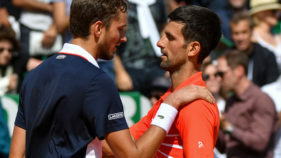 It was not until first-half injury time, when a series of corners ended with Nemanja Matic’s shot from the edge of the area being deflected narrowly wide, did Lossl’s goal look remotely threatened. Mourinho responded in decisive fashion at the interval, bringing on Henrikh Mkhitaryan and Rashford for the culpable Mata and the ineffective Anthony Martial. It was a calculated gamble, with Lindelof having already come on, but a sign of the United manager’s desperation and the fact he clearly questioned the wisdom of his own team selection. The pair’s introduction brought about an improvement from the visitors, with Ashley Young just missing the target from 20 yards and Rashford shooting wide from a tight angle. 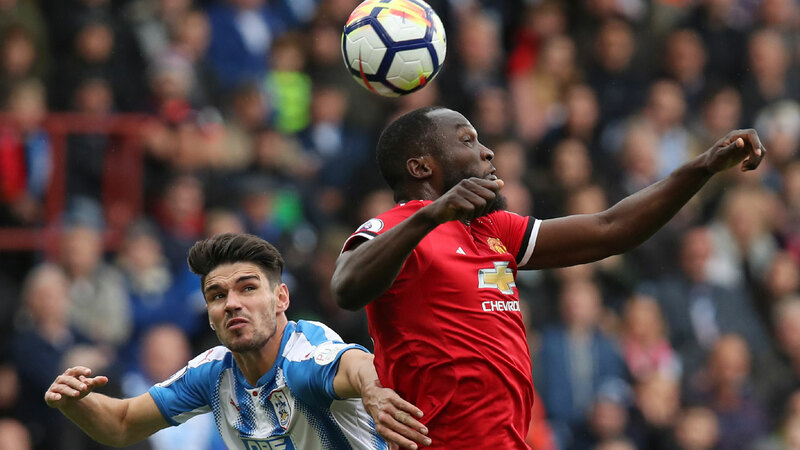 But in pressing for a way back into the match, United were susceptible at the back as Huddersfield maintained their confident play. Substitute Rajiv van La Parra had a promising shot blocked from a half-cleared free-kick and yet more errors, this time from Jesse Lingard and Chris Smalling, almost let in Depoitre for a third. Finally, United produced a strong last 15 minutes. Just before Rashford’s goal, Lossl was called into action for the first time as he kept out a close-range Ander Herrera header. Rashford did find a path to goal for United, but Huddersfield held out.